One of the most prominent Soviet Arctic scientists of the 1920s and 1930s, Mikhail Mikhailovich Ermolaev was a geologist, physicist, and oceanographer. After working in the Arctic for some thirteen years, he was arrested by the NKVD, convicted on a trumped-up charge of "sabotage," and sent to the Gulag for ten years. After barely surviving a year of correctional hard labour in a lumber camp, Ermolaev was appointed to a sharashka, or professional team, which was charged with extending the railroad to the coal mines of Vorkuta in the farthest reaches of northeast Russia. Still later, he and his family were exiled to Syktyvkar and Arkhangel'sk. Remarkably, Ermolaev was eventually able to resume his academic career, ultimately establishing a new Department of the Geography of the Oceans at Kaliningrad State University. Translated from the original Russian and edited by William Barr, this biography is a fascinating personal account typical of the experiences of so many Soviet citizens who were unjustly banished to the infamous Gulag. Because Ermolaev was part of a specialist team, the conditions he and his family endured were better than most, with reasonably comfortable quarters and relatively adequate food. However, his story still clearly illustrates the brutality and inhumanity of the system. Ermolaev's son, Aleksei, was one of the authors of the original Russian-language biography published in 2005. 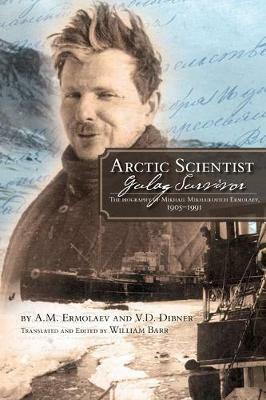 His own recollections of his father's arrest and of the family's experiences while his father was in the Gulag, along with an excellent selection of family photographs, infuse Arctic Scientist, Gulag Survivor with a sense of immediacy and personal connection. Thanks to the expertise of William Barr, Ermolaev's story is now available in English for the first time.